If it was a fish, this would have been the one that got away. Luckily, carrots don’t put up much of a struggle. I was pulling weeds out of an overgrown garden bed on the weekend, and noticed some carrot leaves among the mess. Megan had just harvested the last of the carrots (about a kilo worth) from the bed before I got started, so I figured she missed one. Needless to say, I got a bit of a surprise! In case you can’t read the scales, it clocked in at 894 grams – almost as much as the small bucketfull Megan had spent half an hour picking! Does anyone else have any monster vegetable stories? That’s insane!!! It must’ve been an effort to get it out of the ground. 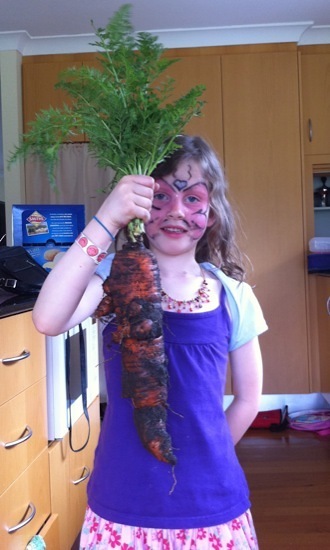 That is a very impressive carrot – well done! You must have very well prepared garden beds. 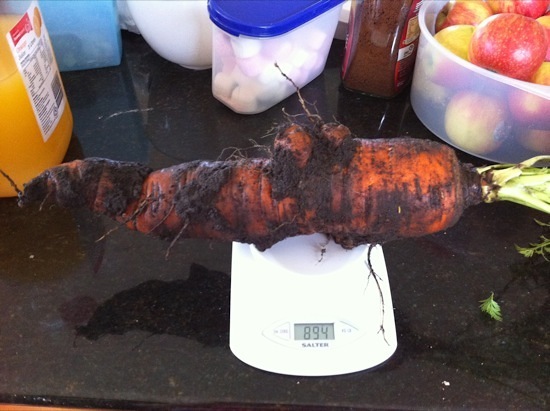 Very impressed as all my carrots so far have been short and stumpy, however I can boast about a 499g tomato last summer 🙂 I’ll be trying to beat that this summer, tomatoes are in the garden already….. Thanks everyone! We ate the carrot this week, and it was perfect. I was sure it’d be woody and horrible, but it was sweet and tasty like a normal home-grown carrot. Yum! That looks great! It’s our first year to grow carrots–hope they look and taste as good as yours. @Chris: It was huge, and surprisingly edible! I’ve always found carrots tricky to get started, so pay them close attention for the first month or two and you should be fine.